Though blueberries are a treat widely available in stores, wild blueberries abound in the forests of the eastern United States and seem to be even tastier when they’re discovered while on the trail. Touted for their antioxidant properties, blueberries are also an important food for wildlife. In the home garden, blueberry bushes provide year-round interest with their spring flowers, summer fruits, fall color and winter bark. The blueberry and its relatives are one of the most common shrubs in the North American continent, occurring as 43 separate species across all 48 contiguous states, Alaska, Canada, Mexico and even in Hawaii. The cranberry, lingonberry, bilberry and huckleberry are all members of the blueberry family. Fruits from all of these plants are edible by humans. The most widely dispersed and easily recognizable of this category of shrubs are the highbush and lowbush blueberries. Vaccinium corymbosum, or highbush blueberry, is the most recognizable variety, as it and many of its cultivars are widely available for purchase in commercial nurseries, and the fruits are sold by the pint in grocery stores. 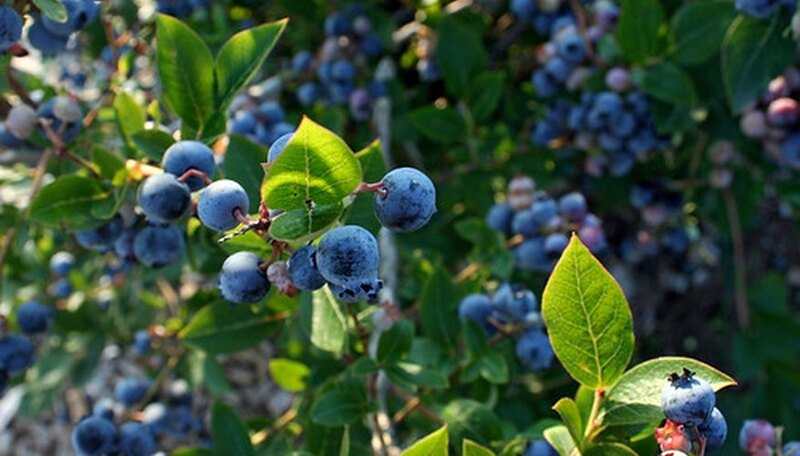 The highbush blueberry’s native range stretches across most of the North American continent from Alaska, throughout Canada and into Maine, south to Florida and Texas and west as far as Colorado. The dark, shiny green leaves of the highbush blueberry are 1 1/2 to 3 inches long, oval-shaped with a point, and have a tough, leathery texture. On the twig, leaves grow alternately, or spaced out along the branch. The margins of the leaf are smooth and not serrated. In the fall, the leaves of the highbush blueberry turn a fiery red, which make the shrub stand out where it grows as an understory plant in boggy pine forests. In the springtime, white, bell-shaped flowers appear which eventually turn into clusters of dark blue fruits, each of which are between 5 and 10 millimeters across. Ripe fruits have a faint whitish “bloom,” or powdery sheen that disappears when the fruits are rubbed or bruised. As its name implies, the lowbush blueberry, or Vaccinium angustifolium, is the much shorter relative of the highbush, growing to only 2 feet where its cousin can reach 15 feet in height. The leaves of the lowbush blueberry are similar but have distinct differences. Also a tough, shiny green, the shrub’s leaves grow only from 1 1/2 to 2 inches long and though pointed are somewhat more rounded along the edges. Leaves are arranged alternately but the margins of the leaf have fine serrations. The lowbush blueberry’s leaves also turn a bright red in the autumn months. The flowers and fruits are much like the highbush blueberry, though smaller. White, bell-shaped flowers appear in the spring, and the fruits are quite diminutive, reaching only 5 to 8 mm across. The plants grow across much of the same range as the highbush blueberry, though it does not occur south of Tennessee or west of Manitoba, Canada. The lowbush blueberry grows on rocky outcrops as well as in bogs and swamps.